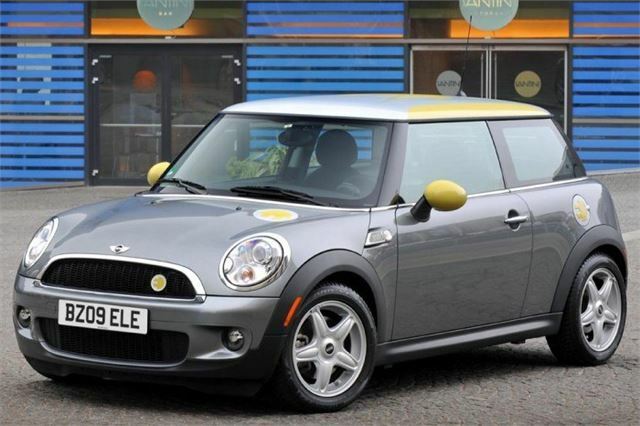 Guest Test of the MINI E all electric MINI by Martin Gurdon. Big car makers have been talking the talk about electric cars for years, but few have actually tried selling them. Prototypes are made, there are tightly controlled field trials involving ‘partners’ such as local authorities, but the cars never reach the showrooms. A good example of this is Peugeot, which built battery-powered 106 superminis in the late 1990s. Now MINI appears to be going down a similar path. It’s built 600 electric examples of its enduringly trendy hatchback. All are left hand drive, with 150kw (the equivalent of a whopping 201bhp) DC electric motors in the front, juiced by lithium-ion batteries so hefty that they take all the space formerly occupied by the rear seats and a large chunk of boot space. Further compromise can be found at the front –they’re all left hand drive- but the company makes no secret that these are prototypes. It canvassed for twenty people living in an area covering London, Oxfordshire and part of Hampshire (MINIs are made in Oxford and this is project partner Southern Electric’s stamping ground), to pay £335 a month to lease the cars for six months them give them back, when the exercise will be repeated (something set to happen this spring), provided drivers have a garage to keep ‘their’ cars and the associated charging points. An on-street charger isn’t an option. Those whose names are drawn out of the metaphorical hat will be driving cars which are perfectly useable as urban transport; the market niche where most vehicle makers reckon ‘battery electric vehicles’ (a.k.a. ‘BEVs’) will sell. If nothing else, this Mini is a portent of things to come. Electric motors have such huge reserves of go that they don’t need conventional transmissions. 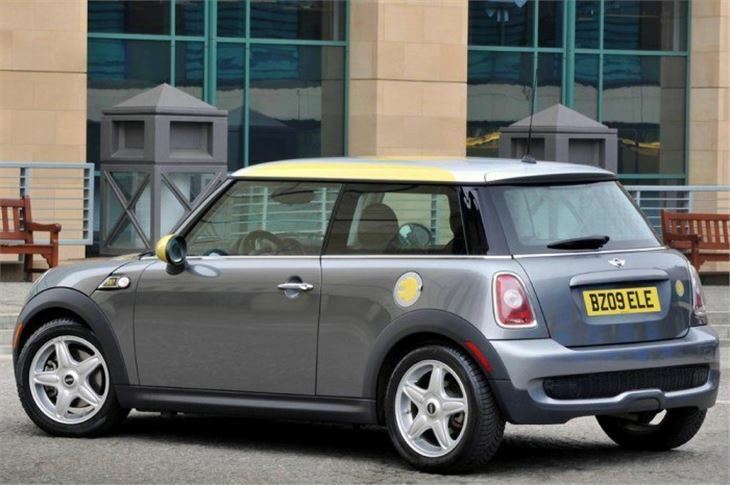 Power is delivered seamlessly as soon as current is fed to them, and the electric Minis will hit 62 in 9.5 seconds, and can provide instant, shove-in-the-back acceleration, accompanied by a low key electrical whine. At trundling speeds it’s virtually silent, but there’s so much power that hard acceleration induces mild torque steer. Its top speed is claimed to be 95mph. The cars drive like conventional, two-pedal automatics; there’s a familiar transmission quadrant to select drive, reverse of neutral and reverse, the only real difference comes when lifting off the accelerator, because at this point the motor flips from power taker to battery re-charger, a process known as ‘regenerative braking.’ It also helps slow the car, to such an extent that the brakes are usually only needed to bring it to a stop. Getting the best from the system requires smooth use of the accelerator or deceleration can be a bit jerky, but the technique is easy and painless to master. How far will the car go between charges? In ‘ideal’ conditions 156 miles is claimed, with 100-120 flagged up as being more within its normal range. However we do wonder if sustained use of wipers, air con, heating, etc, would bring this down further still. When the battery is begging for mercy, power to the motor is cut back to that the car can trundle on for a bit longer. Recharging times? 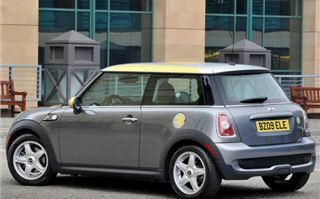 MINI reckons four and a half hours for a full electrical top up using the approved re-charging point, although drivers can give it a mini-top up in about two and a half hours. They can even plug it into a regular three pin socket, but that takes ten hours. This inflexibility remains a bugbear of all-electric cars, but this one’s backer claim £1.50’s worth of cheap rate power is all it needs for a full charge, and anyone travelling 240 miles a week would pay about £14, compared to £170 in a petrol car returning 35mpg if the fuel costs £1.10 per litre. 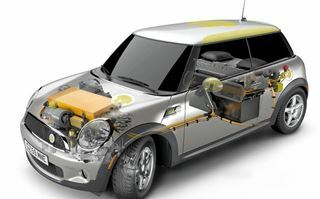 Although the electric Mini is thoroughly painless to use and actually fun in the way it handles and delivers its power, the time it needs for re-charging and the huge amount of interior space stolen by its batteries do show up the limitations of the technology it’s championing, especially when applied to a car originally designed for conventional engines. With engineered-from-the-ground-up electric cars it should be possible to free up interior space by sneaking bespoke batteries into areas of the vehicle’s structure denied them in this one. Putting electric motors in wheel hubs –although this throws up other engineering difficulties- would do the same, but until quite recently, there hasn’t been the commercial imperative to make such cars and invest in the necessary charging infrastructure. However, it now looks as if they’re finally coming. BMW, MINI’s parent, is promising a true, all-electric city car by 2015, and they’re not alone in preparing electric models for short hop, city drivers. Meanwhile the electric MINI shows how well the technology can be made to work, even if for real world drivers it’s a bit of a marketing fig leaf.